Cass Brooks' carefree life changes abruptly and forever when she incautiously walks into the road and gets hit by a truck. When she awakens in the hospital she hears the terrible news that because of the accident she will never walk again. Suddenly everything she's taken for granted before becomes a struggle. The simplest of tasks, such as getting dressed or entering a building for a job interview, feel impossible and out of reach for Cass and she understandably has a very hard time adjusting to this brutal change in her life. Thankfully she has two very caring parents and when her mother introduces Cass to the fantastic work of Canine Partners, a whole new world opens up to her. She immediately falls in love with a Labrador called Ticket and she decides there and then to go through the training programme in the hope of being able to adopt him. In Ticket she not only finds a much-needed friend but also a tremendous aid in her every day life as with his help she slowly but steadily regains her independence. Another incredible organisation that has a prominent position within the novel is Back Up. They help Cass realise the seemingly impossible task of going on a skiing holiday despite her disability, which gives her a real boost of confidence. And not only that, but on the holiday she meets Charlie and he quickly becomes one of the most important and inspirational people in her life. 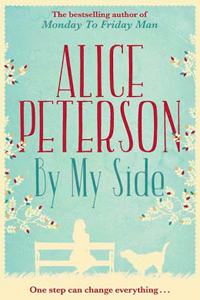 By My Side doesn't quite reach the emotional depths I was expecting from reading the similar themed Me Before You by Jojo Moyes and because of that I would class it more as a sweet and touching read rather than a poignant one. Instead of focussing on the healing process in the hospital and the initial hurdles in Cass' path, such as mastering the wheelchair, this is much more the journey of Cass coming to terms with her new life and moving on. Her relationship with Ticket, and later on Charlie, is incredibly important in this process as it helps her regain a lot of the confidence and independence she lost after the accident. Disabilities are a tough topic to write about and I admire author Alice Peterson for telling Cass' story so naturally and opening the readers' eyes to many facets of paraplegia not often explored in a book of this genre. It is what makes the novel a refreshing read for this summer and one that provides substance amongst the plethora of beach reads currently gracing the shelves in the shops. Special mention also to the absolutely stunning cover which beautifully depicts the relationship most central within the story. The combination of the simple drawing and the subtle sparkles in the leaves make this one of my favourites of the year so far.